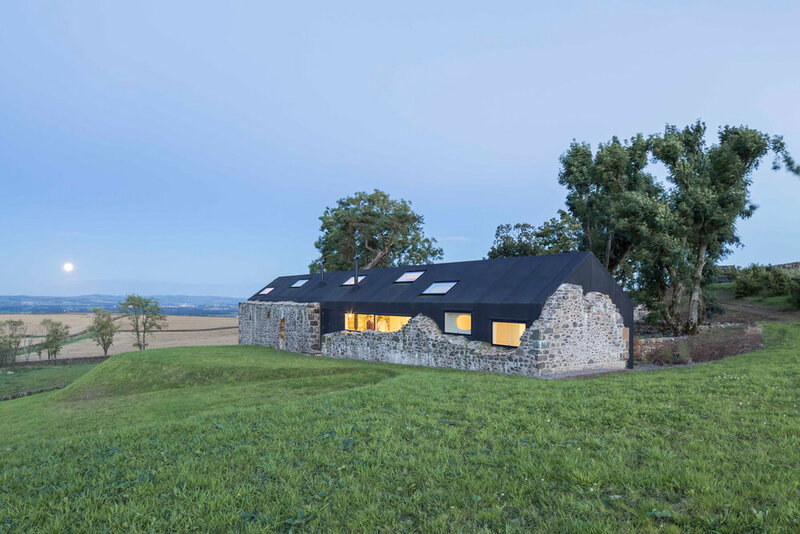 Ruins Studio is a unique project evolved from the derelict ruins of a small 19th Century farm in Southern Scotland. 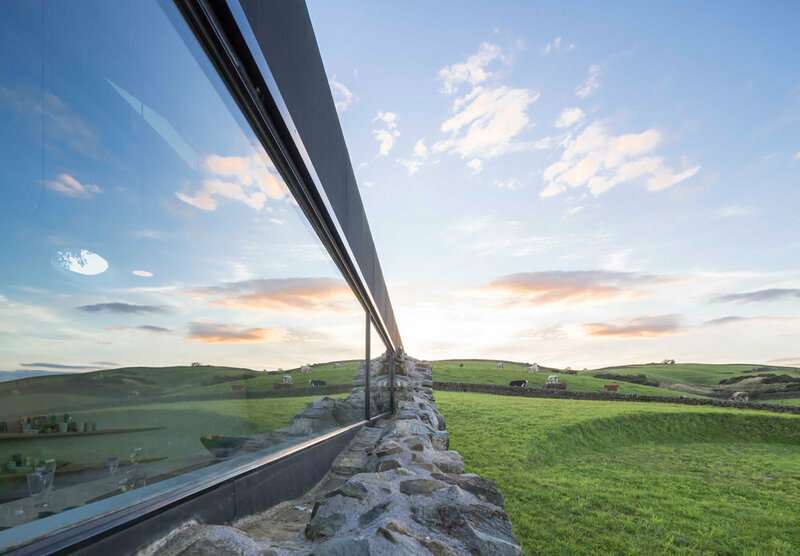 The innovative adaptation of one of the ruined stone buildings to residential use involved the insertion of a contemporary EPDM clad structure into the stabilised stonework. Capturing its state at a specific point in time and helping to maintain the identity of an exceptionally beautiful place, Ruins Studio provides a peaceful refuge for the client and her family from the bustle of London. Millbuies House was originally an early post war modernist courtyard house designed by Robert Matthew. After being sold to Heriott Watt University it was converted to a teaching establishment for students of horticulture. The building is listed category B.When bought by the clients, the building fabric was in poor repair, unsuitable for habitation and the plan layout didn't suit their needs. The brief was to looks at the options for re-modelling and/or extending the house to provide additional bedroom and living accommodation. A major upgrading of energy systems, thermal performance and other services was also required.The refurbishment maintains the integrity of the stripped back modernist exterior, refurbishing and retaining the high quality hardwood cladding, palette of materials and pattern of windows. Existing rendered walls have been extended and new walls added which are sympathetic to the original aesthetics of the house.The house was substantially re-roofed to incorporate a new structure above the original courtyard. The whole roof was thickened to add thermal insulation with a new aluminium edge capping. A new roof was built at the South Elevation to allow the living room to open onto the garden with full height glazing. New penetrations for rooflights were made through the roof to bring light into previously dark internal spaces.Internally, the layout of the house has been changed to suit modern ways of living. The house is entered through the windowless front elevation into a bright entrance hall served by a wide new rooflight. This leads through to a new kitchen and dining area in the old courtyard, now lit by clerestorey glazing on all sides. A large pocket door between this and the new sitting room maintains an open plan flow through to the garden.The master bedroom suite is formed from an open plan sleeping area with dressing room and shower set around a WC cubicle. The house also incorporates two further bedrooms with en-suite bathrooms, one in the former garage space. Other accommodation includes 2 studies, a laundry, utility room and cloakroom.Interior decoration is stripped back to allow the play of light and shadow on the interior walls from the many windows and to show off the clients collection of art.